You have heard me say several times that one of the best parts of this job is the educational opportunities it affords me. I was able to experience this component several ways this week back in the district. Friday was spent interacting with a number of local small businesses that have contributed a great deal towards making the 104th district a great place to live. If you want a great cup of coffee in Danville, go to Mad Goat Coffee. It is a great place to meet people and have some outstanding coffee. My first stop was to tour what will soon be their second location in Danville on South Gilbert. I’m looking forward to stopping in when the shop is open, and I want to congratulate the owners on a true Danville success story. The next stop was touring Park’s Livestock state-of-the-art wean to finish pork operation. Advancements in pork production have changed significantly since I was a kid in 4-H, and it is great to see Illinois agriculture thriving right here in the district. On Friday afternoon, I had a great conversation with Matt Thomas from Design Group International, a firm based in Champaign that helps structure organizations for success through consulting work. It is exciting to see businesses and not for profits being organized at a highly effective level right here in East Central Illinois, and I was happy to learn about the firm’s success. Finally, we announced our first installment of our monthly Local Business Spotlight. Every month, we will be featuring a small business from the district that stands out in a big way. The first business to be highlighted was Tacos y Nieves Calvillo in Danville. Tacos y Nieves Calvillo is a small restaurant on Vermilion Street in Danville that has outstanding authentic Mexican Food. The owners, Alex Fernando Rodriguez Lopez, Luis Fernando Serna, and Osbaldo Herrera recently celebrated their fourth anniversary of serving great tacos in the Danville area. If you love Mexican food and you find yourself in Danville, stop in. You won’t be disappointed. Saturday I was able to travel around the District and visit with constituents. I was happy to support the Tilton Fire District at their Pancake and Sausage fundraiser. After filling up there, I made the trip for seconds at the Savoy Rotary Club Pancake breakfast. It is always great to attend local community events visiting with constituents, and the pancakes taste pretty good, too. Monday found me back to visiting with businesses. I stopped in at a forge in Champaign, Clifford Jacobs, that builds a variety a parts for industries including components of heavy mining equipment, trains, and defense helicopters. This year marks the 100th anniversary for Clifford Jacobs, and it truly is a prime example of longevity and tremendous success in Central Illinois. I rounded out the week at the Atkins Group, where we had several in depth discussions on the business climate and policy changes coming down the pike in Springfield. It is a great help talking to all of these tremendously knowledgeable people from across the business spectrum when I am preparing to vote on policy changes in Springfield. They are the experts in their fields, and every bit of insight helps me craft my decisions that will ultimately impact the economic climate in our district. This input from all of you in the 104th district is invaluable. 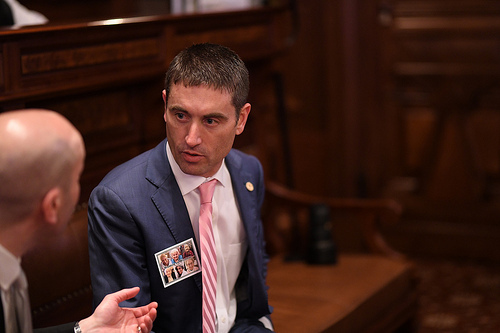 On Tuesday evening, I headed home from Springfield to attend the public Illinois Environmental Protection Agency hearing on permitting the bank stabilization project at the closed Dynegy plant on the Middlefork of the Vermillion River. It was a long evening, but many impassioned and concerned citizens voiced their opinion on the proposed plan. I was happy to make a public statement urging the IEPA to find a permanent solution to the Coal Ash problem on the river, that protects the river, the local economy, and taxpayer liability. In short, the ash needs cleaned up and we need to find a reasonable solution that addresses all of the stakeholder’s concerns. Back in Springfield, I started working hard to line up supporters on my resolution, HJR 47, to form a coal ash task force. If there is a way forward that is amenable to all the stakeholders, then we owe it to our State to try to find it. We need this problem fixed locally, and hopefully if successful, we will find a model by which other locations across the State can handle this problem. It was great to meet with the Champaign County First group when they visited us in Springfield this week. In almost every community that I represent in Champaign County, there are very exciting things happening. I was appreciative of the constituents that took the time to fill me in on all their great projects, and I stand ready to assist in any way I can to bring good things to both Counties that I represent. 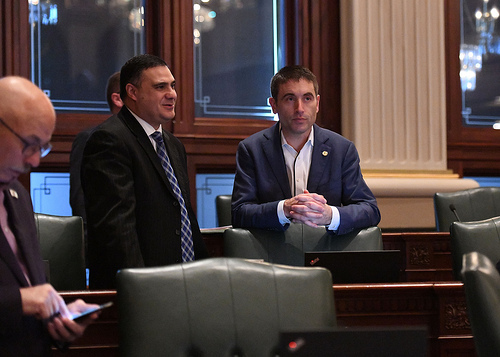 The highlight of my week had to be getting my first bill passed, HB 3213, which is a small technical fix to clean up language in the TRS pension code. It didn’t do much but clean up some legal language and created some efficiencies for reporting that could save money in the long run. It was a small step forward, but first steps usually are small. This was a positive change and hopefully the first of many good things to come. Doing good things for the State and especially for the 104th District is why I am here. I’ll keep working hard in that regard for you, and I appreciate all your support. Together we can and will make a difference.